SCE engineer Eliza Ramirez (right) shares her experiences with her mentee, sophomore Dastaja Coleman. 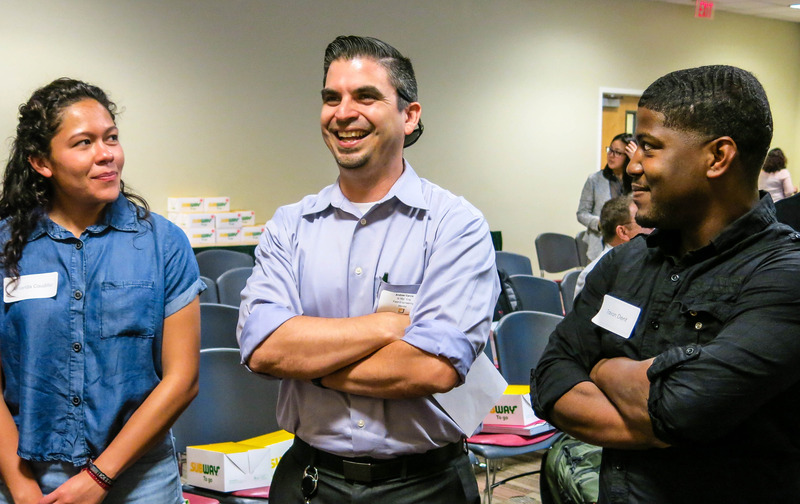 SCE engineer Bryan Watkins (right) gets to know his mentee, Antonio Nunez. SCE engineer Vichaya Lipipun (right) and her mentee, Jesus Acevedo, discuss their common interests at the mentorship program kickoff event. The 10-week mentorship program gives engineering students real world, career perspectives. As Eliza Ramirez maneuvered the hilly, winding path leading up to the California Polytechnic University Pomona student center, she noticed that, aside from some construction to expand the campus, little had changed since she graduated two years ago. Walking into the big angular building, she recalled the uncertainty she felt as a student waiting to start her career. 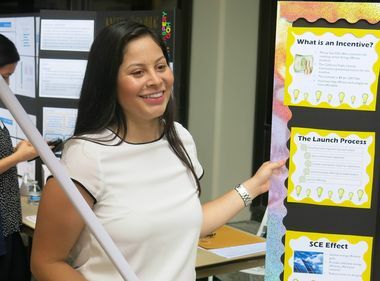 Ramirez recently returned to her alma mater as one of 20 Southern California Edison engineers who volunteered to be part of the Cal Poly Pomona – SCE Corporate Mentorship Program. The 10-week program aims to help engineering students connect with someone in the industry and receive guidance about career opportunities. Ramirez wants to provide her mentee with a real world, day-to-day perspective as an engineer and give her some insight about the innovative science and technology involved in her work. SCE engineer Andy Garcia (center) participates in group activities with his mentee, Travon Dent (right), and other engineering students. Many of the SCE engineers work in Grid Modernization, where they are working to modernize the electric grid by supporting the continued growth and integration of key environmental technologies. Cal Poly Pomona engineering students applied to fill 20 spots in the pilot mentorship program. Senior Travon Dent knows firsthand how important electricity is after growing up in a home that didn’t always have power. Fueled by his experience, Dent wants to work in power-related fields to make energy more efficient and accessible to less affluent families. 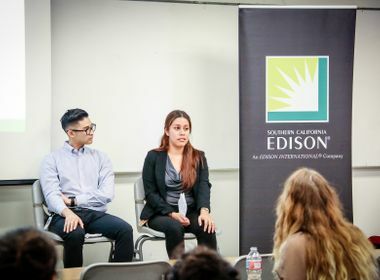 While the mentorship program is aimed toward helping students navigate the energy industry and engineering as a career, it also allows SCE to develop relationships with bright young minds and highlight future internship opportunities. 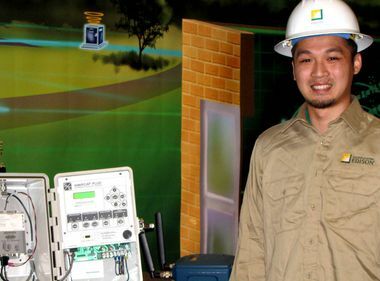 It’s not uncommon for SCE interns to be converted into full-time employees. Ramirez, who also interned at SCE, hopes the mentorship program will open the door for students to have real, hands-on work as an engineer. “Now that I’m on the other side, it’s my turn to give back,” she said.